Not Supermom? Don’t Sweat It. If you’re a parent of a Frozen-obsessed child, you’ve probably heard the phrase “Let It Go” sung a thousand times by now. But have you actually put that advice into practice? This Mother’s Day, maybe it’s time to say “Let It Go” of the idea of perfection. 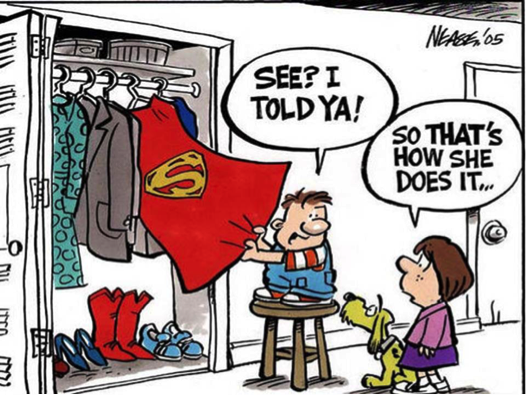 The idea of the “supermom” has become ingrained into the fabric of our culture as something to be aspired to. The Supermom does it all—She takes care of the kids, the house, the cooking and cleaning, and has a successful career as well. She’s flawlessly put-together, never leaves the house with uncombed hair or sweatpants, never misses a single event or obligation, and despite being busy sunup to sundown, she always has a healthy meal ready for her family at the end of the day. She smiles while chauffeuring kids to school and after-school activities, and knows all of the dates of the upcoming field trips and parent-teacher conferences. She is the glue that holds everything together. Everyone around her wonders how on earth she gets everything done. She is perfect, unflappable, and unstoppable. For some, maybe. For most… No way. Here’s my advice for my fellow moms on Mother’s Day: You don’t have to do it all. Do what you do well, and be proud. Let the rest go. Ok, so you’re not perfect. So what? Perfection is a high bar, and an unforgiving one at that. Put it into perspective by thinking about what you expect from you child. Wouldn’t you hope that your child tried their best, used their strengths to the best of their abilities, and was kind to themselves? Maybe you should expect the same from yourself, too. I wonder if part of the reason that motherhood is so often described as a “balancing act,” is that moms feel pressure to be everything for everybody. Let’s put the Supermom problem into DISC terms. Supermom starts by trying to be the very best of the D-style personality: A strong authority figure that never caves in, and knows how to set and enforce limits. Then, she tries to balance that with the best traits of the I-style personality: Fun, spontaneous, creative, and energetic. Once that’s covered, she adds the traits of the S-style personality: selfless, stable, fair, and dependable, always putting family first. Finally, she tops that off with the best traits of the C-style personality: organized, independent, and thorough. Are you feeling exhausted yet? The problem is this: Many moms feel pressure to embody the best traits from each personality type, and feel guilty when they inevitably come up short. Maybe that’s why parenting is so hard—Because it requires us to draw on personality traits that we value, but don’t instinctively possess. Feeling the burden of flawlessly executing tasks that don’t come naturally to us can result in a lot of pressure and frustration. Perhaps the best gift you can give yourself this Mother’s Day is permission not be to perfect. We talk a lot about finding and capitalizing on your strengths at work. At work, it’s important to know what you’re good at, and where you fall short. From there, you can create a team around yourself that fills in the gaps and achieves a balance. At home, then, instead of trying to be Supermom, create a Super Support System. Draw on the experience and skills of your family and friends, your partner, your community, your kids. It’s not all on you all the time. And even if you don’t have a support system to draw from, just do what you do best, and be proud of it. So this Mother’s Day, don’t feel badly about what you don’t do, or can’t do. Do your best. Do you. By loving and appreciating your own strengths, you are teaching your child about loving and appreciating their own strengths as well. After all, there is no such thing as a perfect child, or a perfect parent. The most important personality trait you need to have is acceptance. Accept that you are good enough. Accept that you are trying your best. Accept yourself, warts and all. I love you for always putting our family first. I love you for teaching me responsibility. I love you for being tough on me, and never settling for less than my best. I love you for bring joy and playfulness to my life. No matter what their personality type, that’s a gift they will appreciate, and will carry with them far beyond the short 24-hours that is earmarked for Mother’s Day. What are some of the things moms of different personality styles are good at? D: Setting expectations and enforcing limits. D: Having confidence in their children so they learn independence and self-reliance. I: Playing and having fun with their kids. I: Being present in the moment, paying attention to their child without distraction. S: Giving emotional support, comforting and reassuring their child. S: Listening to and respecting their child’s thoughts and feelings. C: Setting up well-constructed schedules and routines. C: Providing supervision and guidance, helping them learn and abide by the rules of society.